The Hehe erxian enjoy a rather flexible mythology. 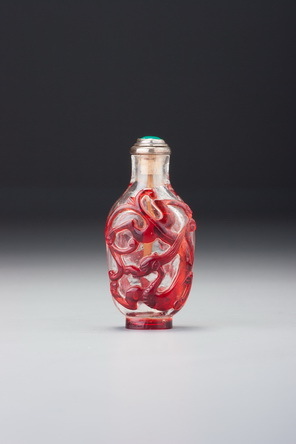 Some sources cite a single individual while others recognize them as two separate individuals, the more common interpretation in later arts including the snuff bottle. The more popular version has them as the seventh-century monks Hanshan and Shide, also sometimes depicted together in their mortal guise where one holds a besom (twig broom). The term hehe, literally means ‘to be united in harmony’, hence the image of two male immortals, their identity made clear by a lotus plant (hehua or lianhua but in this case, the former) and a covered box (hezi), their trademark attributes, chosen obviously for phonetic reasons. Pictures depicting the Hehe immortals were always hung on the walls of reception halls (where wedding ceremonies might be conducted) and in the bedrooms of the nuptials because they were believed to be able to safeguard a harmonious marital life. This is another of the more powerful silhouette bottles of the Official School where superb clarity of design is matched by artistic imagination and where a great deal of the scene is edited by cutting through and removing parts of a very thin plane of darker colour. 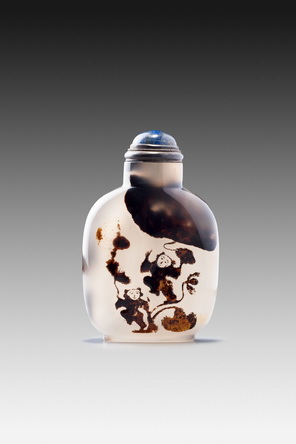 The treatment of the faces here again links it to the broad group of figural bottles referred to under Sale 1, lot 49, but is unusually animated and whimsical, giving the deities delightful personalities.